Boston, MA. 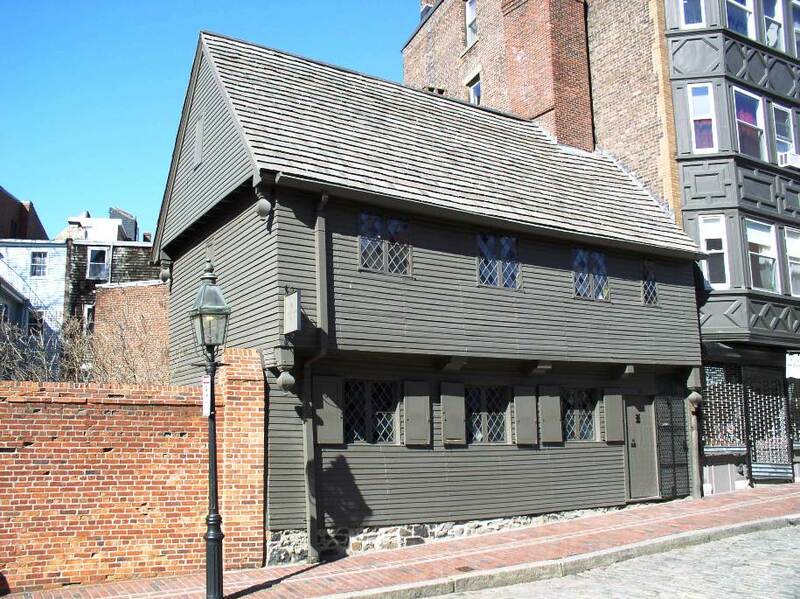 Paul Revere House, c.1680. 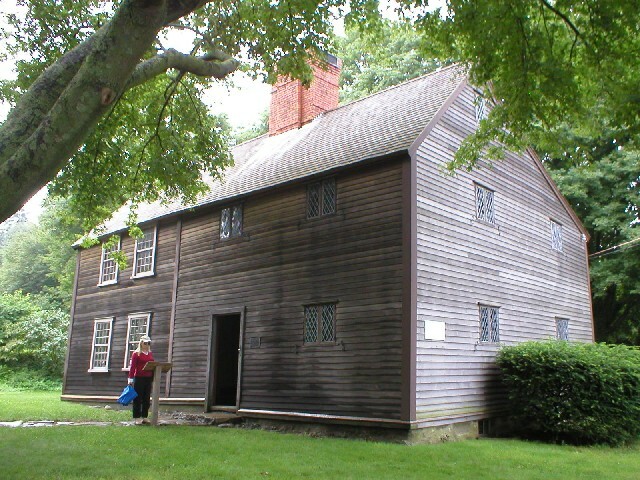 Post-medieval Puritan tradition, with central chimney, casement windows, steeply-pitched roof, and second story overhang, or "jetty" (cantilevered). Oldest remaining house in Boston. Paul Revere's home from 1770-1800. Restored and altered many times, but still retains its post-medieval character and form. IDENTIFYING FEATURES: Typically two stories, overhanging jetty (cantilevered second floor), clapboard siding, diamond-paned casement windows, decorative pendants as simple ornamentation, steeply pitched roof, timber-frame construction. Mostly asymmetrical, irregular floor plans prior to 1700, after which the wealthier English colonists became inspired by the Renaissance and built more symmetrical homes with central doorways. BACKGROUND AND INSPIRATION: This is actually a late medieval (Middle Ages) housing form that diffused from England into colonial America by the mid-1600’s. Leaded casement windows, timber-frame construction, cantilevered second floors, steeply pitched roofs, and often asymmetrical (irregular) facades and floor plans were characteristic features of medieval housing and construction that the Puritan colonists brought with them to America. More commonly surviving today are later colonial versions of the “hall and parlor” house plans, such as the “Saltbox,” which represented the influx of orderly Renaissance ideals from Europe by the late 1600’s. These symmetrical homes include central doorways, evenly spaced windows (or bays), and become larger and 2-rooms deep by the mid-1700s. 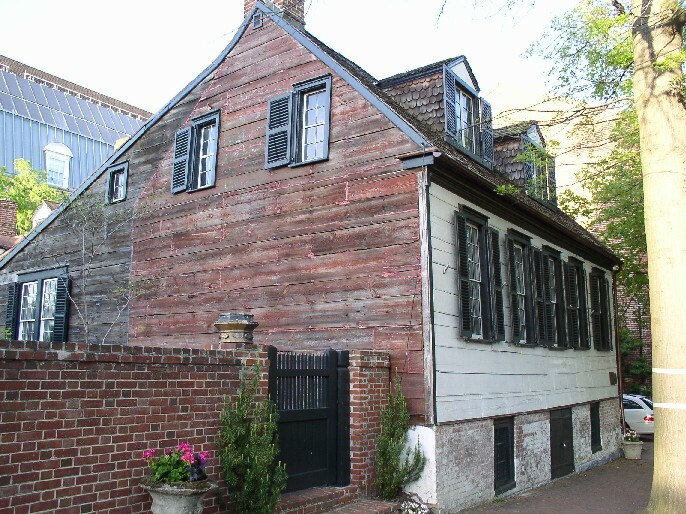 The saltbox form, with symmetrical floor plan and sloping roof in the back (allowing for the addition of kitchen and pantry space in the rear) represents a transition to Georgian style, or the full-blown diffusion of Renaissance architectural styling into the late English colonies. By this time, double-hung sash windows of standard sizes were replacing the smaller, medieval casement windows with their diamond-shaped, leaded panes. 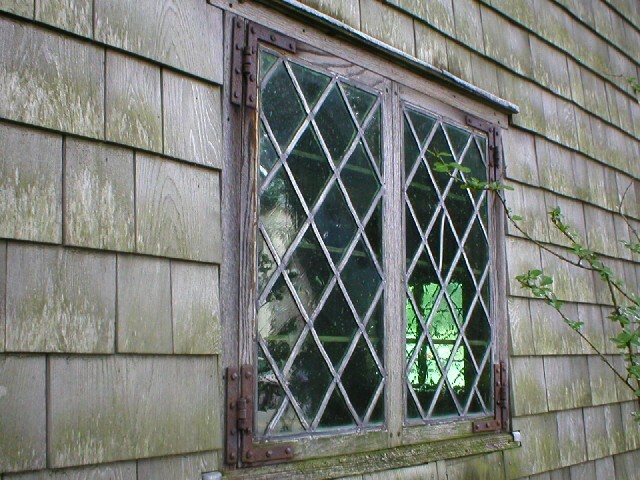 Glass window panes were starting to become more common, more affordable, and available in larger sizes due to improved manufacturing techniques. Alexandria, VA. Post-medieval English. The John Douglass Brown House, post-1654. Was a farm house, now engulfed by urban Alexandria. Includes a Southern raised first floor, above ground level. Plymouth, MA. Howland House, c.1667. 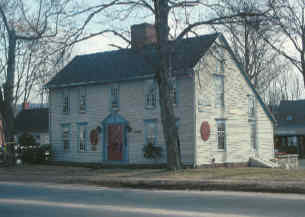 Includes small casement windows, large central chimney, two stories, "updated Georgian" style to left side of house, saltbox (sloping rear) roof. Plymouth, MA. Sparrow House, c.1640. Closeup of diamond-paned casement windows. Plymouth, MA. Sparrow House, c.1640. Two stories, small casement windows, saltbox (sloping rear) roof, large central chimney. Somers, CT. c.1746. 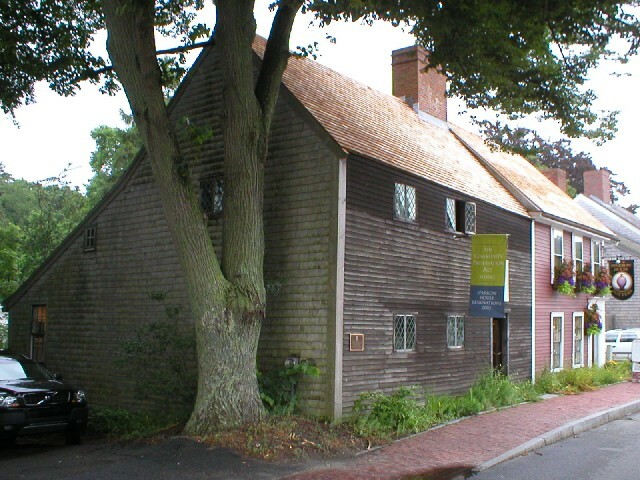 Medieval English Saltbox house, due to the sloping back roofine, very commonly found in colonial New England. Other late Medieval features include hall and parlor floorplan (bilateral symmetry) and central chimney.